It's an old saying, and all the coaches suggests that too many blitz and lightning games may not help in the development of strategic thinking in chess. As more of these games you play, the more you tend to depend on your "instinct" rather than the "tactic" or the "positional understanding". So how do you folks divide your time in between the Standard, the blitz games and of-course the lengthy and time taking ICS lessons? There are only 24 hours in a day, out of which at a max, you can get upto 7-8 hours to devote for the game. So how is your time management? Give us a sincere reply as this will be advantageous to all of us. I'm studying 90%, Standard type games (20 mins) about 4% and blitz 6%. So in other words, I am hardly playing much at all. Thanks a lot for sharing, BorgQueen. Kind request to others also to share. In the week 100% ICS study (theory and exercises). From friday to sunday i play 1 to 2 otb competition games (quikest timecontrol = 2 hours/40 moves + 15 minutes KO, longest timecontrol = 2 hours/40 moves + 1 hour Quick play finish). So i dont play blitz, lightning or even online (except those chess games with three or more days per move on gameknot, chessmail and chess.com). I don't do blitz at all. I'm trying to learn the ICS repertoire as quickly as possible and I think that blitz will undermine the memorization work until I've completed the learning. (The openings have been the glaring weakness in my play and is my number one priority). My current approach is to drill with Chess Opening Wizard the roughly 3700 positions (1.d4 repertoire through month 3) in a blitz like fashion looking at the notes and to do lists at all of the leaf positions. This takes hours! When I reach the point where I am above 90% accurate in memorization drills I port the repertoires to Fritz and play quick games - 25 mintues for me and 5 for Fritz. I play weekend tournaments at at long time controls, and will play quick tournaments a 20 minute time controls when there is one nearby. So far I'm only averaging one tournament a month, less than I had planned. I'd estimate that between the openings and the main course I'm spending about 50% of my time on each. I plan to do blitz at some point, but not until after I've mastered the opening repertoire (which I guess is after month 5). Eventually 1 or 2 rapid games (30 0) but never long 45 45 cadency for example. And the 2h30 remaining will be ct-art training or ICS lessons. So i play more than i study, but if i read too much at a time, i cannot apply it properly i noticed. Some weeks i play less and have a look at some ICC videos, or i simply replay GM games at chessgames.com. http://www.chesspositiontrainer.com/ is a good program to learn the opening the way you want/ are doing. Thanks. I've heard some good things about that software. I'm using Chess Opening Wizard which is similiar, and frankly couldn't do without it or someting like the chesspositiontrainer. I'll find out if it works or not in my next competition, it will be the first tournament that I'll have ever entered with a complete (well for white anyway) repertoire. Can the ICS repertoire be added to this and have all the notes? Or did you add those notes yourself? Atm I'm just manually typing it all in and copying over the notes. I think this is definitely something that I'll be using a lot once I've completed inputting the ICS repetoire. I got the 3.3 version and I have several machines, only two matter though - one with XP, one with Vista. Thanks for the link to fix it... before I even find out that it's broken! Great service!! I'm the author of CPT. As the program was already mentioned and this topics sounds familiar to me from a chess player perspective I just wanted to make you aware of a feature which helps to get the best out of both approaches. I personally use CPT to study and learn my openings. However, like many other chess players I'm also "addicted" to blitz games. Beside the fun factor it also helps me to improve my tactical skills (and time management) and to test and try ideas for the middle game after my opening theory ends. There is a feature in CPT which let you run your blitz games against your repertoire and thus easily learn from your blitz games. Run Games Against Repertoire looks to be a very useful feature. 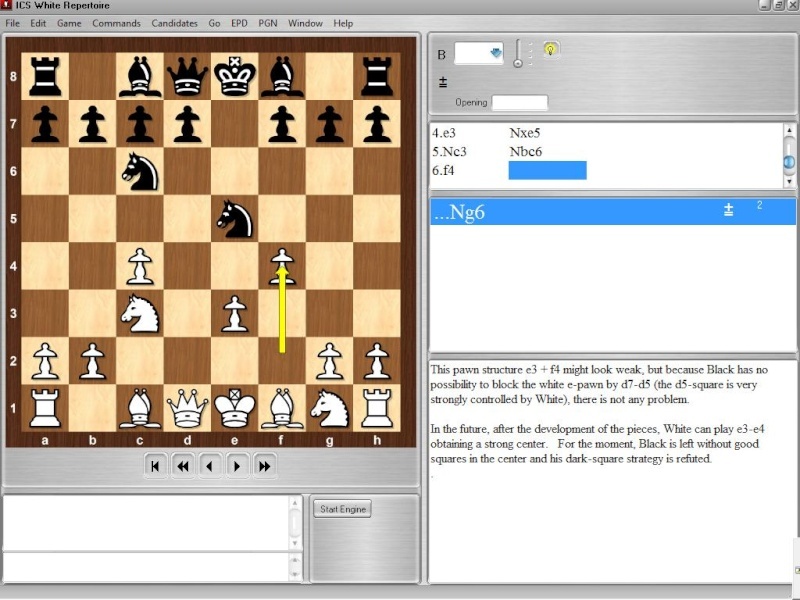 To aswer BorgQueen's question, Chess Opening Wizard can import the commented pgn games. Once imported some editing is required for format. Although not technically difficult, I have to convert the course notes from chessbase formats to pgn, which requires other software. I use Chess Assistant software to do the conversions. So it is a cumbersome process, that takes some effort and time that I was hoping could be done more efficiently. The end result is worth it. When in training mode I can choose whether or not to display the strategy notes as I practice guessing my moves. Can't ChessBase do a "Save As" to go from chessbase format to PGN? Definitely sounds like the end result of what you are doing would be very helpful if made available to others! BorgQueen wrote: Can't ChessBase do a "Save As" to go from chessbase format to PGN? That I don't know since I don't have Chessbase. If it does, I suspect it would be the way to go since some of the clean-up I do is removing what I think are chessbase opcodes converted to script comments. Well I found a way to copy games from a chessbase DB to a newly created PGN database, but I don't know if it is going to be any better. If you send me a chessbase format database to convert, I will copy the games from it to a new PGN file and sent it back. Then you can tell if it is a good way to do it? I don't think the course authors would appreciate anyone publishing their work on the web. I'll look around to see if I have something to post. On the original topic: blitz is better than nothing, especially if you are trying out a new opening it is useful to get a feel for the challenges you will face in more serious games. But if your goal is improvement at the game, not just enjoyment, then I do agree that blitz is not the best route. When I was serious about improvement, I would try to play 30 30 (at minimum) games twice a week online. That's not really long, but it is enough to have a few real thoughts during the game. PawnCustodian wrote: I don't think the course authors would appreciate anyone publishing their work on the web. I'll look around to see if I have something to post. Never say never, i gave a shot to CPT and tested the training method. My critics goes to the lack of flexibility we have, all the moves have to be done exactly one way and it's not possible to go off-road a little. Also, but it's not CPT issue but package issue, the opening lines always propose good moves from your opponent. But in practice a human opponent will do a "wrong" move and you will get on your own because this was not practiced with the software. I would prefer a training module that also teach me what to do with an inaccurate move from my opponent on move 6. rather than one that teaches me all theoretical lines till deepness 20. Also somehow it's not really possible to mix packages, i mean for example at some point you are training carokann but if opponent give his queen a stroll in the variation, it would be fun to transpose to scandinavian. I did not see how it could be possible to zigzag accross multiple opening schemes at the same time. I don't have those problems with Chess Opening Wizard (COW) software. I have all of the ICS openings through month four converted. Where there are transpostitions (and there are a lot of transpositions) they are identified and I can follow either line. COW has a training option that allows the user to select whether the computer and/or player must play the top line only, or allow other variations to be played. One of the things to watch for in the ICS repertoire is that it includes blunders and traps. They are identified and essential to understanding how to play the openings. Once I've seen them I pull them out of the training (I must play the top line when training) so as to not reinforce bad moves in my play, but I still practice lines where the opponent doesn't play the best line. As you point out, there's a drawback to putting all of your repertoire in one book. It took me over a week to train the 1.d4 repertoire, about 15-20 hours to go over each line (correctly) three times.